Years ago, if someone were to tell me that there was one single product that solved dozens of health and beauty woes, I most likely wouldn’t have believed them. One product that you can use tocook, moisturize your hair, remove your makeup, and hydrate your skin? Not possible, I would have thought. However, this little miracle does exist. And, unlike many fancy beauty and cooking products out there, it is free of chemicals and 100 percent natural. This wonder is none other than coconut oil. If you rub a little bit of coconut oil between your hands, you will immediately notice how incredibly moisturizing it feels on your skin. As a face and body moisturizer, coconut oil is much more hydrating than average store-bought lotions because the oil penetrates deep layers of the skin and actually helps to strengthen underlying tissues (Huffington Post). It will also help remove dead skin cells, removing any rough or flaky texture from your skin’s surface and giving you a full body glow. You can use coconut oil as a moisturizer for your entire face, but I like to put it under my eyes and on my lips before bedtime. For my body, I mix equal parts coconut oil and body lotion together to create an ultra hydrating cream, and I apply it right when I get out of the shower. You can also add essential oils like lavender or vanilla to scent your oil, but many people love the natural, tropical scent as it is. The best part about this oil is that it will absorb into your skin without feeling oily or greasy. Just as coconut oil works wonder for your skin, it will also give your hair a silky texture and tons of shine. I use coconut oil as a hair mask at night after I’ve washed my hair. Simply heat up about 3 to 5 tablespoons of coconut oil in the microwave, so that it’s a warm liquid. Then, after it has cooled, apply it to your hair as you would any hair mask. Put on a plastic shower cap or wrap an old T-shirt around your head, and leave the oil in while you sleep. When you wake up, wash your hair and discover your best hair day yet. You can thank me later.Note:Unlike store-bought hair masks, coconut oil is all natural and great for your skin. So, if a little bit happens to rub off onto your pillow while you’re sleeping, you don’t have to worry about dealing with clogged pores or a breakout the next day. One of my favorite uses for coconut oil that I discovered all on my own is it’s gentle power to remove makeup. I was applying a bit under my eyes one night before bed, and I noticed that it was easily removing some extra mascara that hadn’t washed off with my face wash. Now, before I wash my face, I use my finger to gently rub downward on my eyes and eyelashes to remove my eye makeup from the day.Tip: Leaving a little oil on the base of your eyelashes can actually help them grow a bit, so it’s ok if you don’t rinse it all completely off afterwards. Coconut oil is also one of the healthiest oils to use when cooking. Our favorite nutritionistShira Lenchewski, RD., explains that unlike animal fats, which are made up of long chain triglycerides (LCT), coconut oil is made up of medium chain triglycerides (MCT). MCTs are metabolized more rapidly in the body than LCTs, so there’s increased fat burning potential. Many healthy oils (like olive and flax) break down into harmful compounds when heated to their “smoke-point.” But coconut oil remains stable at higher temperatures, so it’s a great option for stir-frying and pan-searing. For cooking, Shira recommends using unrefined coconut oil, also called raw or virgin. 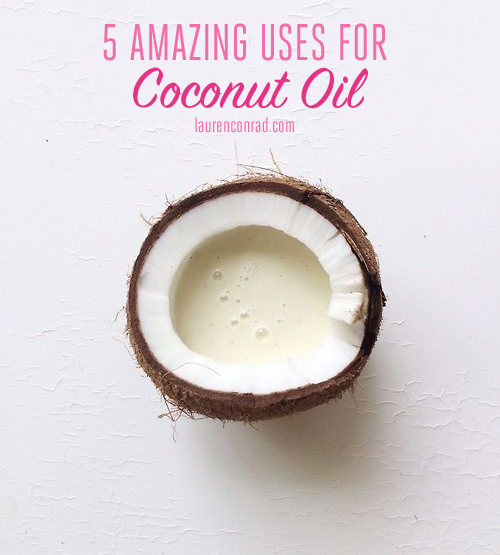 Coconut oil is a great ingredient to have in the pantry if you love baking. Shira says that because coconut oil is a saturated fat, it’s a great substitute for butter in baked goods. Saturated fats are the typical fat of choice in baking, due to their favorable effects on texture. And while saturated fats don’t have the same beneficial effect on good cholesterol as mono- and polyunsaturated oils, they do play a role in various brain and body functions, explains Shira. Tip: Always buy unrefined, extra virgin coconut oil, since it goes through the least process and is closest to its natural state. For cooking, make sure your coconut oil indicates that it can stand high-heat, not just medium heat. I also take a coconut oil supplement with my daily vitamins to make my hair shiny and my skin blemish-free. And I’ve been using coconut oil to experiment with oil pulling. I’ve been trying it for the past two weeks, so I’ll be sharing my results here on LaurenConrad.com in the coming weeks…stay tuned!